Before I even touch on Nicolas Cage’s excellent performance, I want to dedicate as much text as possible to the true main characters of this movie: the visuals, and the soundtrack. Nothing about this movie would be as transcendental as it is if were not for the incredible visual choices made. Primary colors course through the veins of this film, with lighting that makes no logical sense in the best way. Blue flickers through a house, almost as if lightning were arcing through it, over and over in order to reveal the terrifying forms of the Black Skulls. Red fills the frame and bleeds out every other color as the insane form of Jeremiah Sands preaches his cults manifesto straight into the camera. The lighting and color has no natural, logical source. It exists purely as an artistic and atmospheric flair, and it injects so much life and purpose into the film that it’s difficult to convey with words. It is ethereal and electrifying, it is beautiful and terrifying, it takes you to another world and keeps you there for two solid hours. The reasoning behind all of this is not just to make a film that looks good, but one that transports you into another world, one populated with tigers, LSD, biker gangs, cults, and the terrifying visage of Nicolas Cage. This is a fantasy film, if only because the atmosphere of the entire piece feels so other-worldly. There are hints around the edges of supernatural goings-on, but nothing explicit is ever touched on. Instead, the audience is invited to immerse themselves in this world that is unlike anything they’ve ever experience, created from the ground up to be the intersection between beauty and violence. I can’t emphasize enough what a difficult feat it must have been to craft this movie, with it’s dark tone and buckets of blood, to also be awe-inspiring and elegant. The aesthetic of the movie perfectly matches the tone, and in fact establishes it more than anything else in the film. Large chunks of the movie are relatively dialogue-free, so it’s up to the visuals to tell the story and convey the message, and it accomplishes this task effortlessly. As much credit as I give to Panos Cosmatos, the director, I have to give the cast their fair share of the credit here as well. In Mandy, they are essentially living set pieces, existing to extend and perpetuate the tone of the film. Mandy, the titular character, (played here by Andrea Riseborough) is a terrifying beauty, existing in this realm that is at times both comforting and unfamiliar. There is no doubt about it, she looks creepy, especially with the scar(?) on the side of her face, and her deep, dark eyes that seem to stare into your soul. But she also possesses a beauty and innocence that propels the film forward by making her into the victim of the story. By letting us spend time with her, she becomes someone that we really do want to see avenged. And Linus Roache playing the cult leader Jeremiah Sands is an absolute terror, manipulating and exploiting his followers, using drugs to brainwash them into falling in line with his narcissistic self-worship, and generally taking whatever he wants, regardless of morality. In the first half of the film, there are some genuinely terrifying scenes of him and his apostles, pupils frighteningly wide from their constant LSD abuse, giving them an unnatural look that lends itself to the evils they commit. As with most of the roles in this movie, Jeremiah Sands is really just an incredibly well acted archetype, which for it’s purposes works extremely well. He has no motivation besides clinical levels of narcissism, and yet despite this, the talent behind the character makes him incredibly memorable. It goes along with what I wrote earlier about the film daring to take itself seriously. A lot of things that Jeremiah does could, when taken out of context, be used as a punchline or played as a joke, but within the context of the film, and all of his other actions, these things because deeply unsettling, as you realize you are staring deep into the mind of a truly disturbed individual. His insanity is placed front and center, and Mandy forces you to look at it without wavering. The joy that filled the theater as Red was loosed upon the world was so clear, as we all rejoiced in the chainsaw duels, the beheadings, the axe he creates from scratch, it is all a culmination of the movie’s atmosphere that it works so hard to cultivate. It revels in the pandemonium and asks us to join it in it’s celebration, and the satisfaction of seeing such a seriously dark movie simultaneously bring true enjoyment to it’s audience was so fantastic. 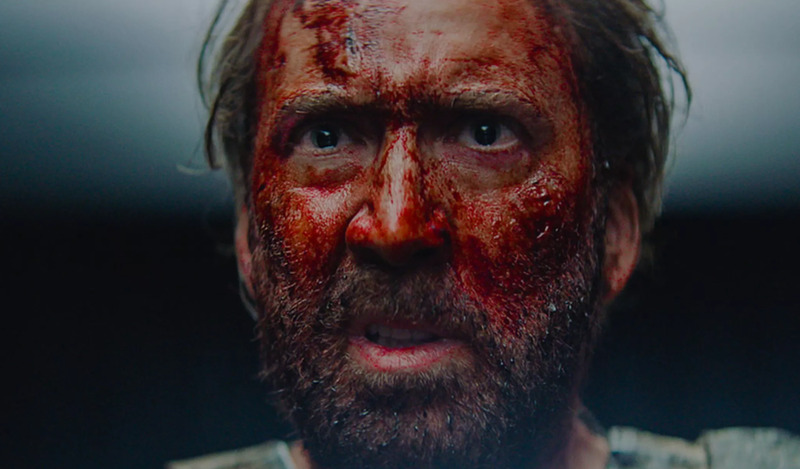 Mandy is not a film for everyone, really it’s not a film that most people would enjoy. But that’s okay, Mandy exists in a niche that doesn’t need wide-appeal. By allowing itself to focus on it’s strengths and amplify those elements to 11, it has become a truly unique film, existing on the borders of beauty and brutality.